When President Obama’s executive actions on immigration were announced on November 20, 2014, much of the focus was on the very important relief programs of Deferred Action for Childhood Arrivals (DACA), and Deferred Action for Parental Accountability (DAPA). Tucked within the announcement was a very small provision stating that the White House was committed to streamlining our immigration visa system–a system that is fraught with backlogs, keeping millions of immigrant families separated. The White House formed a task force to propose changes to the current visa system within 120 days of the announcement. This task force posted a Request for Information (RFI) in the Federal Register. Community groups responded to this request with the resounding message to keep families together. 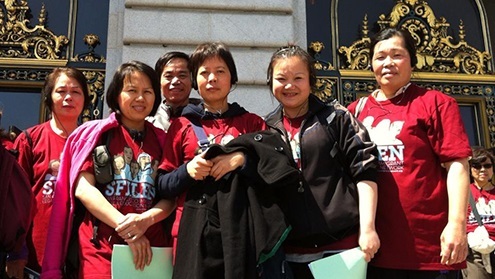 In parallel, Asian American and Pacific Islander community organizations from around the country, including Chinese for Affirmative Action in San Francisco, sent a message to the White House calling for it to use all existing legal authority to alleviate the family backlogs which are disproportionately impacting Asian families. Keeping families apart due to flaws and inefficiencies in our immigration system is unjust and uncompassionate, particularly when fixing that system is completely within our government’s power, stated Annette Wong, Immigration Program Manager at Chinese for Affirmative Action. Additional Asian American advocates from across the country to send in community feedback to the White House were the National Korean American Service and Education Consortium (NAKASEC) and its affiliates, the Korean American Resource and Cultural Center (KRCC) and Korean Resource Center (KRC), the We Belong Together campaign, and the Asian American Justice Center (AAJC) and their affiliates. According to White House statistics, approximately 54% of Asian Americans surveyed in 2012 shared that visa backlogs presented a significant problem for their families. At the time of President Obama’s announcement in November 2014, there were approximately 1.8 million Asian family-based immigrant visa applicants waiting to join their families in the U.S. The wait time for visas to be processed for Chinese and Indian applicants can often be up to 12 years and even longer for Filipino applicants, at 23 years. The visa modernization process highlights the ongoing problems of piecemeal immigration policies. Ultimately, CAA and other allies continue to call for comprehensive immigration reform to thoroughly address the root causes of these visa backlogs that separate families. More importantly, we will continue to push for the priorities of family reunification (by scaling back unnecessary deportations), providing a clear and accessible pathway to citizenship for the undocumented, and protecting civil and worker rights.